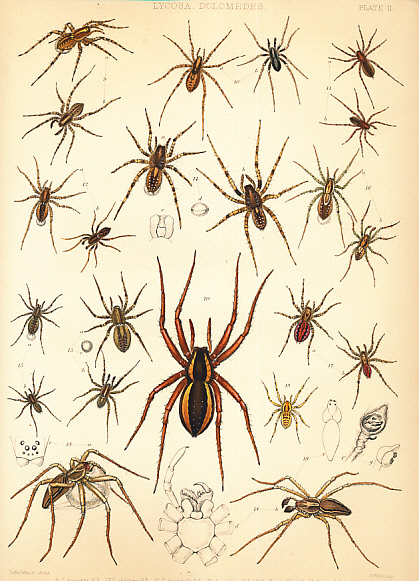 Barter Books : Blackwall, John : A History of the Spiders of Great Britain and Ireland. 2 volume set. 370 x 260 mm (15 x 10 inches) - vi, 384pp; + 29 plates. G : in very good condition without dust jackets as issued. Ex lib with stamps of the University of Edinburgh to page blanks. Sporadic light foxing - damp-staining to corners of a couple of plates. Occasional closed tears to page edges. Some pages uncut.